The motorcycle racer Marco Simoncelli, who was part of an illustrious roll call of Italian world champions headed by Giacomo Agostini and Valentino Rossi, was born on this day in 1987 in Cattolica on the Adriatic coast. 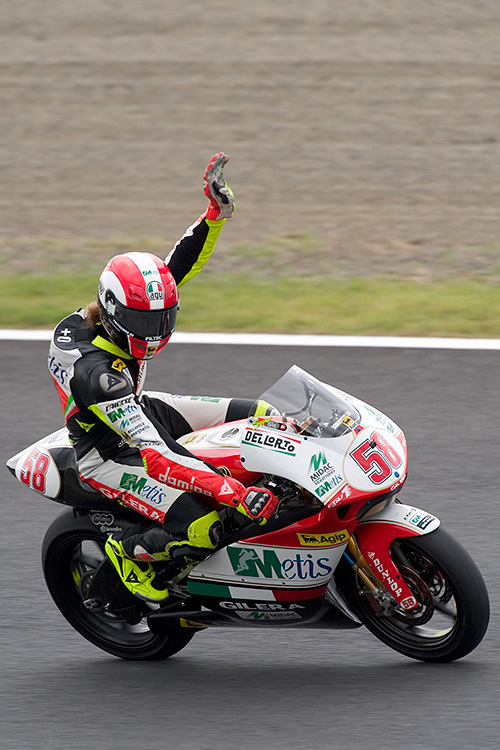 Simoncelli, who was European 125cc champion in 2002 in only his second year of senior competition, became 250cc world champion in 2008 when he won six races riding for Gilera. He had dreams of emulating Rossi, winner of the 250cc world title in 1999, in going on to be a force in the premier MotoGP category, in which the latter has been world champion seven times, just one fewer than Agostini's record eight titles. But after stepping up to MotoGP in 2010, Simoncelli suffered a fatal crash at the Malaysian Grand Prix in October the following year, killed at the age of just 24. On only the second lap of the Sepang circuit, he lost control of his Honda at a corner and appeared to be heading for the gravel run-off area but suddenly veered back across the congested track. With the bike almost on its side, Simoncelli was struck by two other competitors. One of them, with chilling irony, was Rossi, who was entirely blameless but unable to prevent his front wheel from striking his compatriot's head. 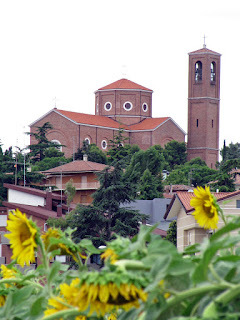 Although born in Cattolica, Simoncelli's home town was really Coriano, which is situated about halfway between the coast and the Republic of San Marino. His parents, Paolo and Rossella, ran an ice cream parlour. Paolo was a fan of all motor sports but loved motorcycles in particular and when Marco took an interest his father was only too keen to indulge his son, buying him his first 50cc 'pocket bike' - a scaled down racing motorcycle, which he would ride in the fields near the family home. Marco began to ride competitively at the age of nine and was Italian Minimoto champion two years running in 1999 and 2000, graduating to 125cc class in 2001 and becoming Italian champion in that category at the first attempt. He began to compete in world championship races in 2002 and won his first GP in Spain in 2004. 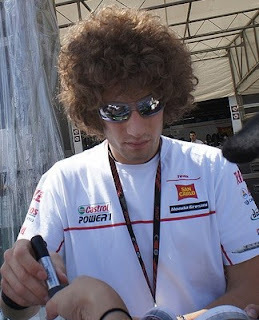 Flamboyant, powerfully built and with his mop of hair worn in a distinctive Afro style, Simoncelli was an instantly recognisable figure who acquired an enthusiastic following of supporters, who knew him by his nickname of Sic or SuperSic. Following the accident at Sepang, a devastated Rossi remained in Malaysia after other members of the MotoGP circus had left to prepare for the next race. 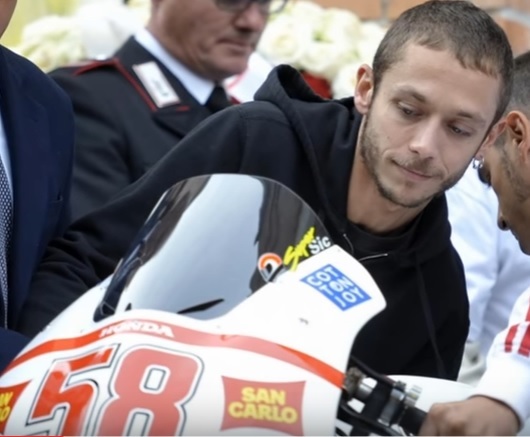 He accompanied Simoncelli's father and the rider's fiancée in returning the body to Italy and spent much of the following days with the family, of whom he was already a friend. 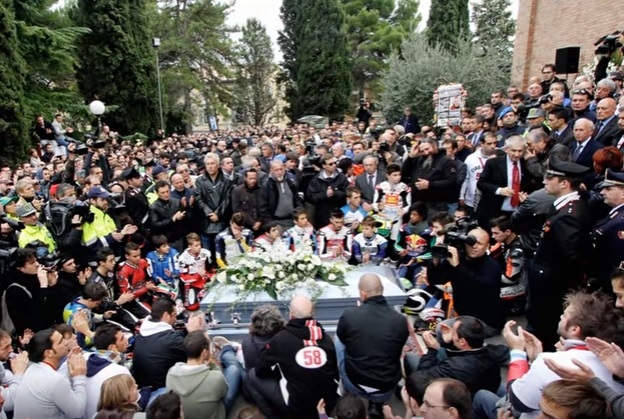 Italy was deeply moved by Simoncelli's death. On the day of the accident, a minute's silence was held before every Serie A football match on the instruction of Gianni Petrucci, president of the Italian National Olympic Committee. The players of AC Milan, the team he supported, wore black arm bands. 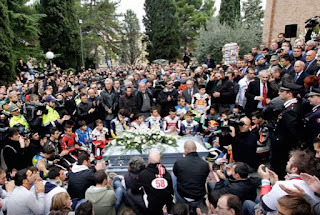 Petrucci was at the airport to receive Simoncelli's body as it was brought home before being transferred to Coriano, where it was placed in an open coffin in a theatre, alongside his 250cc world championship-winning Gilera and his MotoGP Honda, to allow thousands of fans to pay their respects. At the Formula One motor racing grand prix in India the following week, several drivers had the number 58 - Simoncelli's racing number - painted on their helmets by way of a tribute, while at the MotoGP of Valencia, the final race of the season, the riders assembled for a lap in his honour, led on Simoncelli's bike by the American former world champion Kevin Schwantz, whom he idolised as a boy. His funeral at the Church of Santa Maria Assunta took place with a crowd estimated at 20,000 gathered outside. The service itself was broadcast live on national television. Subsequently, Paolo Simoncelli announced the formation of a racing team in honour of his son that would help young riders to achieve their dream of becoming world champion. A monument was erected in Coriano bearing his race number, 58. Simoncelli was inducted to the MotoGP Hall of Fame in 2014 and in 2016 it was announced his number would be retired from all classes of Grand Prix racing and reinstated only at the discretion of his family. Coriano was once the site of one of seven castles grouped closely together in the area of Rimini province in which it stands, which in the 12th century was regarded as of such importance strategically that the armies of the Malatesta and Borgia families, and of the Venetian Republic, Spain and the Papal States, all went to war in a bid to win control. Eight centuries later it was the scene of a deadly battle in the Second World War, which cost the lives of so many Allied soldiers that a British cemetery was established just outside the town. 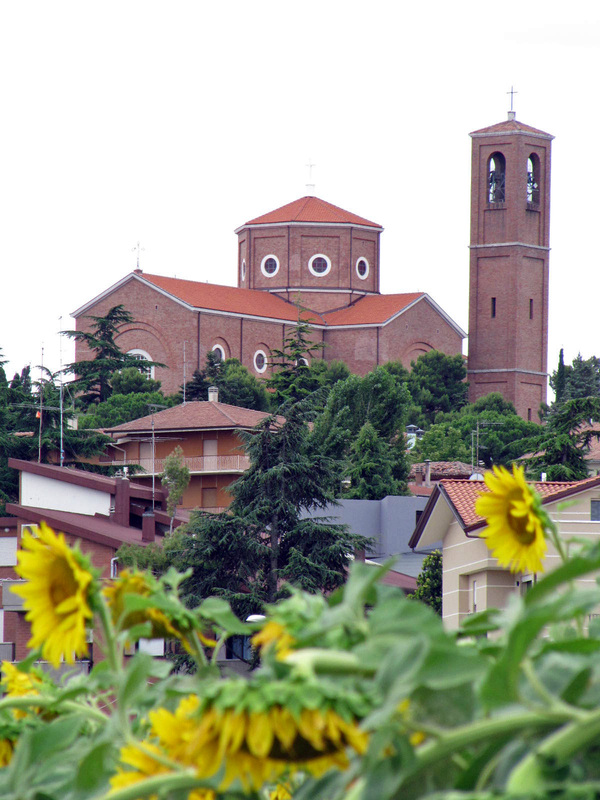 The Coriano skyline is dominated by the Church of Santa Maria Assunta, which was built after the town had suffered heavy damage from bombing in the Second World War and consecrated in 1956. It has a large dome and a bell tower that rises to 47m (154ft). Nearby there is a museum, La Storia del Sic, in Via Garibaldi, which is dedicated to the memory of Marco Simoncelli. In a garden behind the museum is the Simoncelli monument, part of which consists of an exhaust pipe enclosed in a cage which emits a three-metre flame for 58 seconds every Sunday evening.